Is Zac Efron Dating Danish Olympic Swimmer Sarah Bro? Some fans are beginning to speculate that The Greatest Showman star may be dating Olympic swimmer Sarah Bro. Efron and the Danish athlete have not made any public posts about each other just yet, but there have been a few sightings and instances that feel like more than mere coincidences. Bro swam for Denmark in the 4x100 meter relay during the 2016 Olympics. On March 1, both the actor and Bro shared photos on Instagram of a night out at a Los Angeles Kings hockey game. Bro even wore a custom jersey. "Thank you @lakings for making my first hockey game something very special," she captioned a photo of herself in the locker room repping her customized gear. She noted that after just one game, she's "already a fan!" That same day, Efron posted a selfie from the game where he's covering his eyes with his team hat. The Kings played the Dallas Stars on Thursday, Feb. 28 (and lost). Although the near-matching pictures from the Kings game could just be a fateful circumstance, they were actually seen together that same weekend. The 31-year-old attended the UFC 235 fight in Las Vegas on March 2 and was photographed laughing and sitting next to Bro. TV cameras panned to him during the fight and he saluted the camera while she sat next to him and looked on. An eyewitness at the fight told E! News that they arrived together and "looked like they were having a great time." Efron and Bro apparently were "smiling and laughing in their seats" before the show. "Zac was approached by multiple fans and Sarah was very patient as Zac spoke to everyone who approached him," the insider continued. The two of them were reportedly "not overly publicly affectionate" and they "weren't doing anything to attract any additional attention." The two of them left the arena together after the fight. Efron, of course, couldn't make the rounds at T-Mobile Arena because the 17 Again actor is recovering from a torn ACL and surgery. He showed off his massive knee brace in some of his Instagram Stories. "I tore my ACL shredding the gnar. But all is good," he wrote on Instagram on Feb. 8 as the caption of him sitting in a hospital bed with a bandage and brace. Efron said he "opted for surgery so I can come back stronger than ever." On Tuesday, Bro posted a photo of a beautiful bouquet of flowers on her Instagram Story but didn't specify who gave her the floral arrangement. She did, however, add an emoji of pink hearts to the photo. Although she hails from Copenhagen, the 23-year-old now resides in Los Angeles and seems to enjoy every minute of it. She frequently posts photos of herself swimming, spending a day at the beach, hiking and taking in the sunset. 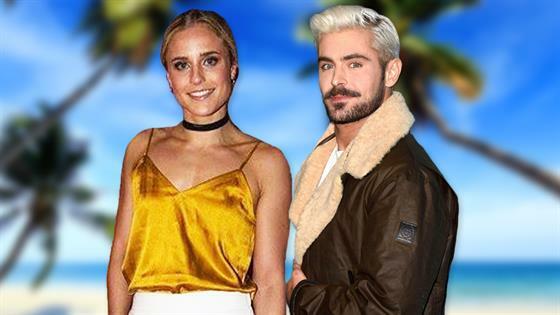 Efron is a California boy, too, and it feels all too appropriate that one of his upcoming movies is titled The Beach Bum. He's also a known surfing enthusiast, although that hobby has probably moved to the backburner since his ACL injury. Efron previously dated his High School Musical co-star Vanessa Hudgens and was also linked to Baywatch actress Alexandra Daddario. He also started following fellow Disney celebSelena Gomez on Instagram last month. Granted, they both appeared in Neighbors 2: Sorority Rising and she is the second-most followed woman on Instagram. So does that make him a fan, a friend or just one of us 146 million other followers?